Garmin GPS 60 (010-00322-51) €153.00 - buy online at mysatnav.ie - Ireland's leading GPS & Sat Nav store. 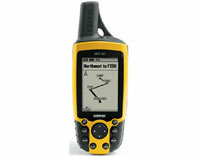 The robust, waterproof GPS 60 is the perfect, low-cost navigator for wherever your adventure takes you. The GPS 60 also provides geocaching features, indoor and outdoor games, an alarm clock, sunrise/sunset and moon phase tables and much more.